I have decided to work this, nothing else will work if I don’t move forward in this area of my life. 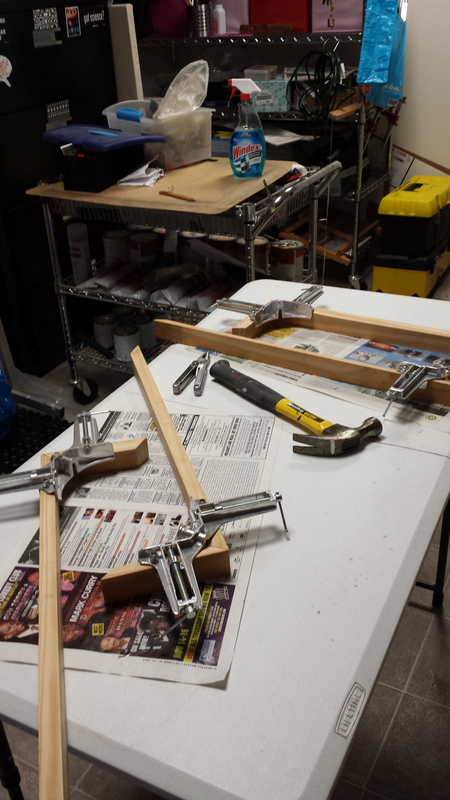 Today I started some new stretcher bars that are 6″ x 24″. This process will take upwards of two days to complete because I can only work on them in halves at a time because my corner clamps are so large. It is best practice to wait four hours for glue to dry but I like to give it longer. Once they are complete and dry I will stretch and gesso some canvas over them and start some new work. I do have one already drawn on a 6″ x 12″ stretcher so that will give me three to work on. I am building a smaller body of work because it will be more accessible in price and easier to ship if that becomes necessary. I have a lot of wood that I had cut planed and sanded for larger stretchers but have since decided that less is more, so I have plenty of fodder for new stretchers as I go along. I will make quite a few at once when I get a nice sunny day that allows me to break out the miter saw. I like to have empty stretchers stacked up, they call to me, “paint on me”! I am also working on a new design for a painting. I have a few new ideas for my alien landscapes series, I am enjoying the process of creation today. New work is on the way!